Absolutely concur and thanks for the feedback Kurt! We are moving ahead with this process and rebooting innovation in our Navy. On 6 June, we are hosting a Junior Leader Innovation Symposium here at NWDC in Norfolk. It is targeted at E5-O4. We are looking for maximum local participation and hope to double that via Defense Connect Online (DCO). Please send an email to NWDC for details. Kurt, great post! Our thinking and innovation needs to move beyond simple “disruption” and become about the hard work of researching and developing actionable solutions. Usually this will occur one solution at a time. Looks like you’re hard at work on that. There is a great naval tradition of innovation. From Samuel Du Pont’s attempts to make the promotion and personnel system more fair in the mid 19th century before he went on to being on of our first Admirals, to William Cushings’ work to develop the first torpedo boats and tactics during the Civil War to early aviation pioneers like John Tower and Kenneth Whiting, just to name a few. 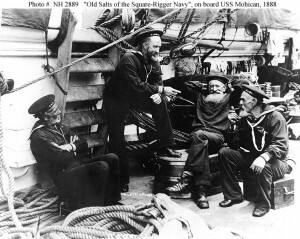 Once upon a time, even a guy like Alfred Thayer Mahan was a frustrated mid-grade officer who wanted to innovate the way our Navy looked at strategy and global affairs. Those who say that new ideas and innovation aren’t “naval” are ignorant of the history of our great service.